I really love this new bundle! It hit my "must have" list as soon as I saw the Catalogue. I saw and admired a card that was made by Sheila Terlep and whilst I didn't actively CASE her card, in retrospect I can see that my card seems very much inspired by hers, so I'd like to thank Sheila. 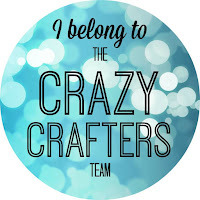 You can see her card at Sheila's Stampin' Corner. Bloomin heart in cream, black and pink. I used the Timeless Elegance Designer Series paper and sponged one strip with Blushing Bride ink. The flowers are cut from Cherry Cobbler, Basic Black and Blushing Bride cardstock to which I've added a variety of sequins from the Metallics and Brights Sequin Assortments and some pearls. I inked up the banner with Blushing Bride and then applied Wild Wasabi with a marker before stamping on Very Vanilla cardstock. 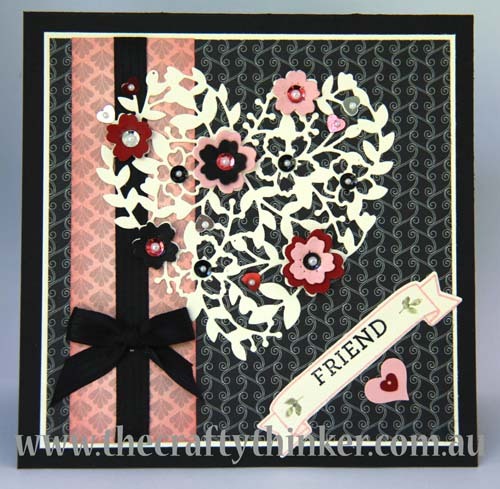 I then stamped the word Friend into the banner before cutting it with the matching die from the Large Numbers Framelits.